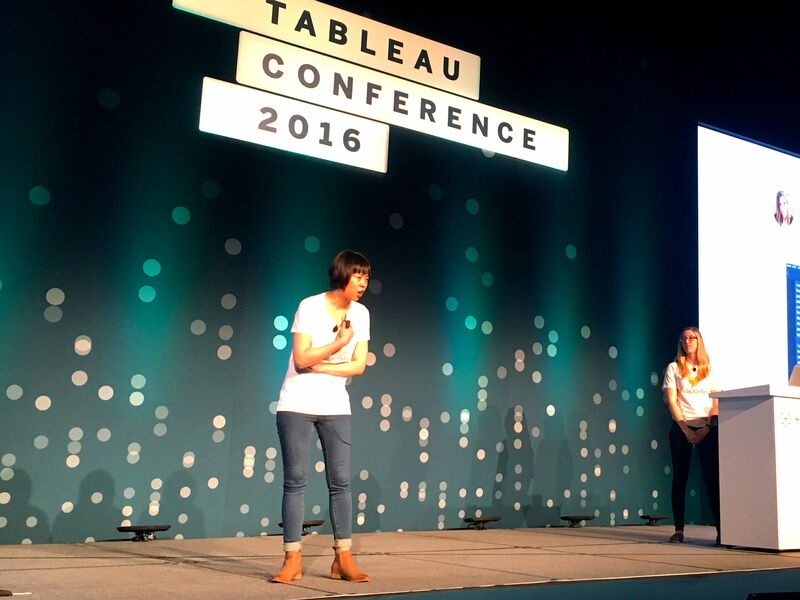 Chloe Tseng, left, is seen presenting with Brit Cava at the Data + Women meetup at TC16. Note: The following is a guest post by Chloe Tseng. I grew up in Asia, in a culture where women were not expected to advance and were only valued for certain things. But my mom didn't believe in that. Passionate about education, she dedicated herself to math education research. Her enthusiasm had been shattered again and again by a broken system that treated women unfairly, but she never gave up. Finally, her research catalyzed a reform, improving the quality of math education and benefitting 1.2 million students. It was her perpetuating commitment to education that moved the world forward. Her resilience made me brave. After graduating from school, I decided to take a leap of faith and become a data analyst. Now at Twitter, I immerse myself in data visualizations and pattern recognition to tackle abuse. I finally found a place to thrive and prove myself, and am so grateful for the opportunities I have. Along the way of my journey, I’ve met so many cheerleaders like my mom who have given me confidence, pushed me to take challenges, and believed that I can do anything. Here are the lessons I've learned from them and my experiences. When opportunities presented themselves, I used to tell myself: “This is not a perfect timing. I am not ready,” “I should take two more Python classes before accepting this challenge,” or “I want to be more prepared, so next time.” But I realized that what I had missed were opportunities not only to prove myself, but also to learn and grow. I’ve started challenging myself by saying yes to opportunities even when I don’t feel 100-percent ready. Every week I sit down and reflect on what I failed at that week, and celebrate it. Why? Because I pushed myself out of the comfort zone and tried something new. If I don’t have any failures to celebrate that week, it only means I didn’t try hard enough. This year, for the first time, I participated in the Iron Viz feeder competitions. I failed three times, but those failures were valuable learning experiences for me. And of course, I celebrated my failures because I overcame my fears and learned so much from all the talented participants. This exercise has changed my definition of failure. The real failure for me is not an outcome, but a refusal to try. And this helps me accept failure more readily and focus on learning. Override your fear when the opportunity comes along. Do it and celebrate it even you fail, and you’ll be surprised by how much you gain in the process. I used to be a timid data analyst, thinking that I was not good enough. I always felt insecure and uncomfortable to speak up, and had a hard time appreciating my small wins. Twitter, where I work, is a very special place for me where I found my tribe and built my confidence. Last year, I was fortunate enough to win Fanalytics at Tableau Conference. When I returned to the office, many of my colleagues, from my manager to a VP, celebrated about my small win as if it were their own. This is just one of many encouraging experiences I’ve had at Twitter. Every day, I accomplish something and fail at something, but I'm extremely grateful to be surrounded by people who empower me to be a better person, motivate me to achieve my vision, and cheer on my successes. Motivational speaker Jim Rohn said, “You are the average of the five people you spend the most time with.” The people around you have a huge impact on your life. The choice is yours. Think about the people you’re spending time with. Surround yourself with people who want you to succeed. And be a positive influencer who gives energy and helps others create the success they desire and deserve. Living in the Bay Area, I’ve been inspired by many enthusiastic and driven women in tech who strive to promote gender equality by creating innovative solutions. Photographer Helena Price is a great example. She tells the stories behind tech's diversity problem by capturing 100 portraits of underrepresented people working in tech. Her project helps increase awareness and understanding of the problems. These initiatives and my own experiences led me to start my project with Brit Cava: She Talks Data (formerly Women in Data), a social non-profit organization committed to ending gender inequality and inspiring women to be leaders in the data-science field. We’ve created an intimate community for women to support each other and build lifelong relationship through authentic dialogues. We hear stories from women about learning new things and rising to new heights in their careers because of the support from She Talks Data. Those stories fill us with joy and motivation. I highly encourage you to start your own project. Anything could be a great project: getting involved in a community, tweeting about women’s rights, or creating a visualization. Never underestimate the impact you can make for both yourself and for others. Brit Cava and I spoke in front of hundreds at TC16’s Data + Women Meetup TED-style talks, and shared our story of She Talks Data. We showed how one project can have a huge impact, and now it’s your turn! We’re please to announce we’re partnering with Slalom to offer three $200 grants to support your initiatives. For more detail check out our Twitter handle @SheTalksData or visit the site SheTalksData.com. We look forward to hearing from you! For more tips, ideas, and vizzes by Chloe, check out her Tableau Public profile page. You can also connect with her on Twitter @datachloe.